Shape: The reduced overall length gives the boards a lively feel. The volume distribution is very balanced throughout the board which is an essential feature needed for early planing and effortless riding. Werner designed the so-called race deck on these boards. The key factor is the raised deck in the foot strap area combined with a round and constant deck curve in the whole standing area. The stance is very comfortable and you’ll stay connected to the board at all times. The Super Sports are as fast as ever whilst being a lot easier to ride and handle than true Slalom boards. For advanced riders it’s easy to get maximum performance out of them. 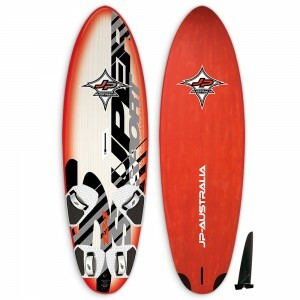 You can stand totally relaxed and transfer all the sail power into the board to accelerate more and more. It’s easy to stay in control when blasting back and forth as well as in the high speed carving jibes. Really fun and fast boards for sporty riders.